First question that everyone gets - did you have the defective weather gene? Yes, I would say so. I grew up watching The Weather Channel with my brother and my grandma. And with some of the storms that hit us when I was growing up in Matthews, a small town outside of Charlotte, I was a weather enthusiast. The Superstorm of 1993. It was the most impressive snowstorm in the South that I had ever experienced, while growing up. Interestingly, it hit on the weekend and I did not miss any school. Did you take your own weather readings as a kid? I was more of an observer of the phenomena. But you knew what you wanted to do when you got to college. Actually, no. I didn't decide to get into meteorology until after I started at North Carolina State. I started college as an engineering major, but there were two events that led me to switch my college major. Hurricane Isabel made landfall, cancelling my flight out of Raleigh to Maine for my brother's wedding. A friend of mine took a recruiting trip to NC State for the swim team and I had an opportunity to tag along for his visit to the Weather Forecast Office in Raleigh. After that visit, I decided to switch majors. I got both my Bachelor and Masters Degree in Meteorology at NC State. How did you use those degrees? After I left NC State, I took a job in northern Virginia as a government contractor, doing some work in transport and dispersion modeling. I picked up some GIS stuff along the way, as well as learning more about how the government and emergency management works during natural disasters. 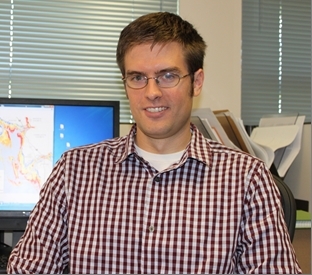 What made you want to apply to the hurricane center as a storm surge specialist? It was an exciting job opportunity. It combined manipulating geospatial information and working with operational forecasts. It was the best of both worlds with research and development of new products and operational work. It was a great opportunity for me to be able to do more than one thing. Storm surge has come to the forefront recently. What is the challenge? The challenge is communicating the risk and uncertainty associated with storm surge. You can't just communicate it with text. You need a graphic, or some other depiction, to help communicate it. Yes, we have been working on a high resolution inundation graphic for a couple of years. It's in the works, and hopefully it will soon become an experimental product issued by the NHC. At first, it will likely be a stand-alone graphic. There are some technical hurdles to overcome to make it an interactive map. For it to be an interactive map, the IT systems would need to be able to handle all the users querying and interacting with the data during a storm event. But the first thing is to get a process to create the graphic, and that's where we're making progress. As technical lead, I get to be involved with all aspects of development for the graphic. Where do you see the storm surge process going? We are also moving toward a storm surge warning as a separate product. We're going to keep pushing forward with this path that we've set and with these products. That's a difficult question. I'll just keep doing the work here, and we'll see. I like sports, and I do a little bit of running. I used to do a lot of swimming — I was a swimmer in college at NC State. I had a big interest in the swimming competition in this past summer's Olympics; it's always the premiere event for swimming and always great to see it come to the forefront.